Make it easier for illegal immigrants to become U.S. citizens? As the debate over immigration reform heats up, a hefty majority of Americans are opposed to making it easier for illegal immigrants to become citizens. A new CNN/Opinion Research Corporation poll shows 66 percent of those surveyed do not want to ease the path to citizenship for an estimated 11 million people in this country illegally. Democrats are more likely than Independents or Republicans to support making it easier for illegals to become citizens. The poll also shows 52 percent of Americans are sympathetic to illegal immigrants and their families - but 47 percent are unsympathetic; and that number is eight points higher than it was four years ago. All this comes as thousands of people attended rallies over the weekend in several cities across the country - calling on congress to act quickly on immigration reform. Activists waved American flags and held signs that said things like: "Stop tearing our families apart" and "Reform now." President Obama has vowed to do everything in his power to get a bipartisan deal through Congress. But it's not going to happen. As these poll numbers suggest - with a sluggish economy and nearly 10 percent unemployment, a lot of Americans don't have an appetite for immigration reform. Under President Bush, Congress tried to do the same thing a few years back, but critics called that effort "amnesty," which is exactly what it was, and the legislation never saw the light of day. Here’s my question to you: Should the U.S. make it easier for an estimated 11 million illegal immigrants to become citizens? I am sympathetic, but we can use California as a model. Do we want the entire country to be in the same financial situation as California? I think not. How can we be of any benefit to the rest of the world if our country is completely broke? Jack, If your numbers are correct and 66 percent of Americans oppose this, then you can be assured that Congress and Obama will shove it down our throats, just like health care. Make the process of immigration easier, but close the door on those who come here illegally. When I visit other countries (including Mexico), I follow their rules. I obtain appropriate visas, go through legitimate ports of entry and make sure that I follow all rules that they require. We should expect no less from those who want to come here either to visit or live. The anti-immigration reform position is silly and impractical. We can either retain the status quo or we can develop a program to make the millions of illegal immigrants, legal. We aren't going to deport the vast majority of these people; we might as well work to make them legal, tax-paying residents. Leaving them hiding in the shadows is simply self-defeating. No. There is already a well-defined path to becoming a citizen. I agree it is not easy, but it isn't supposed to be. With unemployment pushing 10% throughout the states, build the fence, hire immigration enforcement officers and retake our country. You can make it easier or not, but in two more generations we will all be speaking Spanish. I don't think it matters, Jack. The economy is going to determine whether people want to come here or stay elsewhere. Our standard of living is diminishing. Elsewhere, it's improving (relatively). There's less and less incentive to come here going forward. This problem is going to take care of itself. No. Send them back to their own countries. They are ruining America. They are criminals by their own actions. Bring our military home and use it to guard our ports and borders. Sure, let's just make it easier for all lawbreakers to be pardoned with impunity. That's where we're headed, isn't it? Sure, why not? It's what our politicians want, and we sure don't want to stand in their way. After all, one might think we were being racist if we wanted to enforce our laws and borders. But we can't have that in America, can we? Only the politicians know what is good for us, don't they? Well, don't they? No. Citizenship is a privilege and should be reserved for those immigrants who obeyed our laws....waited in line, did their paperwork, got their medical check ups, and learned to speak English. Others may get work permits for certain kinds of work. But no automatic citizenship for their children. No more freebies. absolutely not, how can we talk about immigration reform if we cant simply control our border, we bring more than a million legal immigrants every year! Im dont think the U.S. should make it easier. I'm not one to tell anyone they shouldn't try to come to the "land of opportunity". But i ask, when are there enough carrots in the melting pot? If we make the 11 million illegal immigrants citizens before we fix the laws, then we'll have another 11 million illegal immigrants to deal with by the time we actually fix the laws. In fact, it is my opinion, that if Obama tries to convert all 12 million illegals, into legal residents, that he only THINKS he has seen anger from the public!!!! Why make it easier? It is hard enough for LEGAL immigrants to become citizens! I know first hand. The sooner they are legal, the sooner they start paying taxes! What is so difficult about that? They're here already, so we've got to do something with them. If they eventually become citizens, at least we can get some taxes out of the deal. People carp about the "illegals," but few Americans – even the unemployed – are willing to do some of the back breaking work immigrants do. In any case, the solution to illegal immigration is jailing the people who hire them. Absolutely. 11 million individuals with jobs that could be paying taxes right now, we should definitely provide an easier path for them to become citizens of the states, so long as they learn our laws and start paying their taxes. Why not? The walls do not work and they are going to come now since the violence in Mexico grows worse and the police/army down there are useless to the bone. If you do not want to have immigrants then America must change he saying of We welcome you with open arms. No because they shouldnt have been here in the first place. The only thing that needs to be made easier is finding them for deportation or just shooting them if they try to hop the fence. Jack: I do not think jumping through hoops for 6 to 10 years, and then allowed to get at the end of the line is an easy task. No felony convictions, pass a english exam, pay a fine while you wait, and pass the naturalization exam for citizenship, and in 6 to 10 years you are allowed to get in the back of the line. Oh, by the way, while waiting you have to pay taxes along with your fine for entering this nation ilegally. I would like to see you do this, Jack, for citizenship. U.S. citizenship has already been reduced to a comedy so what are we pretending to be today..........................something special ?? This is a recalcitrant issue that won't go away until we test some of the theories that have been professed. It has been suggested that illegals accept graciously jobs no one else will accept. Let's send them all home, and see how often the union halls for construction workers ring, or how high the wages go for very hard, but unrespected work. It has also been suggested that employers are the real problem ... they turn the other eye, or do little to prevent illegals from their work places. let's set the minimum fine at $1 million and see how fast the job-advertising billboards facing America along the Rio Grande go down. For decades illegals have been waved across the border by officials who looked the other way so the rich & well-connected could have cheap labor. Now that these immigrants have built lives, paid taxes & had children who have never known any other country we should throw them out? What ever happened to "Justice & Freedom for All"? First a 20 foot double fence needs to be installed across the southern USA with electrical wires on top of the fence. Then case by case deal with the illegals. Our good people on the border are now being murdered. When it comes to fences, and Airport problems the USA needs to go to Israel and get some intellligent advice. Ok, big word there illegal. So we should reward their illegal behavior? Are we also going to impose rules saying that 100% of their income must stay in the US economy instead of them living 20 to a house and sending their money back "home" to prop up a foreign economy? With 9-10% unemployment do we really need to import more people to find jobs for? In other words, NO. NO, rewarding the law breakers with a path to citizenship is wrong. Citizenship should only be granted to people who can prove they can support themselves and their families with no public assistance. We simply cannot afford to legally add millions more to our already ballooning Welfare system. Why should we give preference to those who knowingly broke our laws to get here. The bottom line is, in the 70's we offered illegal immigrants amnesty and it did not work. Why should we give preference to an illegal immigrant over someone who is trying to become a citizen legally. Not if it makes it easier for them to get citizenship thatn the tens of thousands of people waiting to gain it legally. These folks broke the law - we need to fix their status and can't deport them. The process would be for them to get in line (at the back of the line, thank you very much) and earn their way in like any one else. In the mean time, the quotas for immigration from their home countries would be offset by the number of illegals now in the queue. No. They should tell employers that jail time is the only option if they are caught hiring illegal workers, and illegals need to be shipped back where they came from. It should be made easier for LEGAL immigrants to get into the country and work. It took me nearly two years just to come into the country as my husbands wife, I have no record back in my own country, and have a high level of education to contribute. And then it took another year to receive a green card. I'm Canadian. It should NEVER take that long. No, it should not make it easier for 11 million illegal immigrants. We should actually be changing our laws in order that children born to illegal immigrants do not automatically receive citizenship in the U.S. Absolutely. Indeed, it should become easier than the method under consideration. The idea that people who have been here for decades must go to the 'back of the line" is insulting. If you removed all immigration restrictions and right to work laws, excessive migration would stop – because it would take away the ability of employers to exploit workers based on their immigration status. Yes, but only if we enforce the laws on the books this time around -unlike our do-nothing stab at this mess in 1996.Does anyone seriously think we are going to kick 11 million people out of the country, even if we should ? By the way, had the problem been addressed years ago, we would not continue to have to deal with this .So much for our gutless( don't want to offend anyone and lose a vote or two) Congress. They are here. The logistics of getting them back to their countries of origin is hopeless and insurmountable. The fact that they are illegal allows for abuses not only of them but our system. It makes sense to move them under the umbrella of citizenship with all due speed. No, no fast tract citizenship for illegals. We have a immigration quota system in place that involves screening immigrants and supposedly eliminates the undesirables, lets use it. Many wanting to migrate to this country have waited years for their number to come up. Why should we reward those that have no respect for our borders to circumvent the system? Let me add that had the federal government not beewn derelict of their duty to control our borders we wouldn't be addressing this problem today. Illegal is the key word. Law breakers should be rewarded with a one way ticket back to the border. We don't want to break up any families so the instant citizen children are welcome to go back with them. Anyone who wants to become a citizen should be required to go through the normal channels to citizenship. I support anyone who wants to come here legally that can support themselves and their families. No they should not make it easier. We should not lower our standards to accommodate the 11 million who are here illegally to begin with. If they want to become citizens fine, do what everyone else has or leave. It would appear that we CANNOT handle the amount of people we have right now.Why should we make it any easier?I respect the people who do it properly and legally.We know of an illegal immigrant from Mexico.We called the local police...not our problem was their response.Same from the FBI.We called ICE and they basically said we are working on it.America does not want illegals yet we do little about it.Someone has to step up and make the decision either way. No. they should go thru the same process that other immigrants have done legally. We should put employers who hire illegals in prison. And i am tried of hearing " who would do those jobs if the illegals did't"
All the un-employed legal american workers and teens that's who !! fast food place you go into has people you can't understand that can't speak english. Enough is enough. Lets make everyone in the world a U.S. citizen. Then we can tax them. No Sir! They should abide by the same standards that all other "legal" immigrants must go through before becoming a U.S. citizen. Why should they get an easier pass? In fact, they should be penalized, because what you say is true: What they have done is illegal. and the brave will lead me home. The should not slip over the boarder and expect to be made AMERICAN citizens NO MATTER IF IT IS 1 OR 11 million. THEY SHOULD BE PROD OF THEIR OWN COUNTRY, GOOD OR BAD!!! Who knows how many arrived since 9/11. George W Bush had a republican house and senate for 5 1/2 years and chose to do nothing. I don't want to hear the republican whine for one second. They could have done something but chose not to, not go still in the corner and say No. Just like you have since George W Bush left office. Yes Jack, America should make it easier for the millions of illegal Hispanics now in America. It seems one of the greatest roadblocks is that nearly all of them would join the Democratic party which the Republican lawmakers do not want to occur. For decades Presidents and the Congress of both party's have made it easy for illegal entry to our nation by not enforcing the laws governing our borders. Easier, why stop now? The nation will be richer for it in talent, expertise, and cultural advances, not to mention political resources. Well Jack, Illegals are here right now, not paying taxes and just being an overall drain on the Government. Making it easier for them to become citizens is a good idea, but only if paired with a harsher and more stern stance against illegals. Make it favorable to be Legal and easy to do so. Then at the very least we can get some taxes out of them. when requesting to enter our country. And there is an easy way to fix it. 1. Require everyone to get a national ID card (An SSN card with picture maybe or a state issued DL/ID that is forge proof) and good in all states. 2. Require it (or a legal visa, green card etc.) to be presented each time you pay a bill, cash a check, apply for a job, at ER's and if you receive any assistance, Etc. 3. Deport any one with out the card that is found by any police agency. 4 Fix the border so no more may come in. 5. Only babies born in the USA with a least one parent with US citizenship will be given citizenship. 6. All employers must verify there employees are legal or face stiff fines. No. As a matter of fact Let's make it law that every citizen has a passport with them at all times . No passport no staying in the country unless you can prove citizenship. Profiling ?Yup you bet.It works in every other country in the world why not here? Jack, a resounding NO! If they were so interested in doing it legally, than they would have. Instead they went around the system, entered illegally and tried to avoid detection all the while sucking up U.S. citizen tax dollars to support them. I say deport them all and let them enter legally. By making it easier, you're telling the world that we don't follow our own laws and if you do get into our country we are too weak to stand up for our rights and send you home. Other countries have clamped down on it, why can't we!!!!!!!!!!!!!!!!!!!!!!!!!!!!! Yes Jack,I believe the U.S. should make it easier for an estimated 11 million illegal immigrants to become U.S. citizens.What kind of ridiculous question is that?After all,America was built by both, legal and illegal immigrants,of all races,who along with their blood, sweat, and tears,and inhumane suffering,made America what it is today.And for many of those same honest,hardworking decent illegal immigrant families,including their children who where either born or raised in America today,should themselves,also be given all the equal opportunities,and granted the same privileges,in becoming U.S. citizens,just like any other normal law abiding U.S. citizen.As long as America keeps ignoring this illegal immigration issue,and not do nothing about it,they will always be looked upon,by other countries,as a Nation that supports a convenient labor issue,while permitting an unjust abusive racist policy against their own illegal immigrant population in America. Oh Gawd....here we go again. It would seem that no one learned the lessons of history when Ronald Reagan granted amnesty to all those illegal aliens as that did not stem the tide of illegal immigration as proposed. Let's get real here. There is only one motive behind why either of these two corrupt political parties in the USA wants amnesty for 11 million illegal aliens and that is for instant voters and increased political power. Anyone who is in favor of legalizing these criminals should be ashamed as they are not true American patriots and the sovereignty of our nation means absolutely nothing to them. Easier yes, automatic no, they should have to get on a list and wait their turn like most immigrants do. Why reward those who broke our laws? .The prison population proves that they broke more laws. We need to send all the gangs back where they came from, and the drug trafficers, and if anyone wants to come here, they can go through the process. Other countries put us in prison for crossing their borders. How do we know that they all want to become citizens? Most are doing just fine being illegal, and the stiff fines might make them want to keep on doing what they have been doing. Making them citizens probably won't stop the welfare, incarceration fees and other programs they are using right now, so we will still be in an economic slump. Silly Jack,.....making it easier for illegal immigrants to become citizens would amount to a TAX on all those small businesses that hire them now for substandard cash wages with no Federal, State or local withholding taxes. This is not the America of the 19th century, and although it would seem more noble to say that mass immigration, whether legal or illegal, has benifited our nation in the past, it is simply no longer practical or beneficial. It would be different, I think, if those coming in across our borders would at least be respectful and quit trying to make this country an extension of the one they supposedly hated enough to leave. No. As a LEGAL immigrant, who waited in line, and did everything asked of me to become a citizen, I was horrified when shortly thereafter Reagan offered Amnesty to millions of illegals. It's just plain wrong. Easier maybe but not easy. Nothing should be easy. They should still have to learn english or at least enough to get along in everyday life. Also they should have to learn the same other immigrants have to learn about our history and government and be able to pass a test showing that do did learn. Then and only then should they be able to become citizens. The US should make it easier to send them back to where they came from. They broke the law and should not get any preferential treatment. Would you hire someone after they robbed your bank? Well Jack, up here we have a program called Amnesty and you would be surprised at how quickly the number of refugee cases drops off the government records !! You know, until the surge happens again [and again !!!!] and then the government starts the program AGAIN !!! I don't agree with this program but it certainly cuts the record keeping issue of the government !!! If there is ever a place for job creation, immigration is it – Having our citizens clear out illegals and put business owners who flout the hiring laws in PRISON [for at least 10 years !!] and seize their assets !!! Should the US make it easier for illegals to become US citizens? No. They are illegals. Case close. No. Every one has to be verified of their criminal record in their country and then only should be given citizenship for those who qualify. They should also speak englees. Of course we should, Jack. Make them own up to breaking the law and make restitution, then collect back and current income taxes. We need the money. All this political posturing just delays the inevitable – we cannot deport all these people. No. Enough already have dual citizenships and work here and go back across the border to live cheaply. This takes away from the American that will work here and reside here too. First, control the borders so "easier citenship" doesn't become "open the floodgates." After that, it is entirely appropriate to work toward naturalizing the 11 million already here. A good place to start would be with the parents of U.S. citizens. (Anyone born in the U.S., whether their parents are here legally or not, is a citizen, according to the 14th Amendment to the Constitution.) It would be cruel, unusual, and possibly unconstitutional to either break up or deport such families. Why?? I thought the law was that you had to live in this country for 5 years and pass a test to become a citizen. One requirement was to be able to write, read and speak English. We already have eight different programs for immigrants to enter this country legally and obtain citizenship. What more do they need? Oh, yes, they need knowlege of, and respect for the law. But, with all of our jobs being shipped overseas it is a moot point. Soon enough the people that did those jobs will be gone also. No. Reward bad behavior and you get more bad behavior. Jack you are a little slow, they have already made it easier by refusing to build a "real" fence to stop the flow of illegals. They have already made it easier by not using the laws on the books that says, illegal entry into the USA is a "crime". That's a no brainer Jack. Why have an immigration policy at all if all you need to do is come in the country via the back door and wait. The only people that will suffer are those that followed the rules. I still maintain that it's not the illegal immigrants that are the problem, but those that hire them. Make the employer pay for their health care, education costs for their children and their income taxes and the illegal immigration problem will go away overnight. Don't give criminals a pass. We are a nation of laws and they broke the law coming here and working with forged documents. Not at all. If we had been enforcing the in the first place this never would have happened. If we prosecuted more people for hiring illegals they wouldn't have any reason to come here. Then ship back everyone who is here illegally and make them wait at the back of the line. We can still have jobs for immigrants but they needt o do it the right way. They need to learn English and integrate into our society. Making things easier for people to skirt rules usually doesn't make your problems better. No ... they should make it impossible. This is a case where the "moral hazard" is a clear consideration. I think the U.S. should make it easier to fly them back over the border. Money is not an issue, if you consider how much we spend per day on the wars in Iraq and Afganistan. Jack: Absolutely not. What we should do is make as difficult as possible for them to stay here. These people came here illegally, are staying here illegally, are working here illegally, and are committing identity theft and social security fraud to do so. They are a drain on our economy and one of the reasons for our health care costs, education costs and welfare costs being so high. We need to enforce and strengthen our existing laws to make coming and staying here a strong negative. Of course, the politicians will not do this as they want their vote and don’t care about anything else. Absolutely not. Are you kidding me? With so many United States citizens out of work, wages closing on slave recompense, and wealthy people (Notice I don't say citizen?) scamming the economy this idea is idiotic. Jack, the fact is that they are here. Dealing with the reality of the problem, may well necessitate creating a method to integrate them into our society efficiently, not necessarily, easily. Absolutely not, why should we reward people for breaking into our country, it makes no sense at all. Now we need to make our government aware of this fact, the law is the law. Our government officials want the illegals just for there vote, and why and how they can legally vote is beyond me. Our government wants to take what they call the easy solution in regards to the illegal aliens. Yes, if they are law bidding immigrants, hard working and a credit to society without being a burden to the tax payers, why not! This nation was taken from the native Americans and a nation was founded by immigrants. No one made an issue about these immigrants becoming US citizens. Why should we deny citizenship and be prejudice against certain immigrants and not others. Would it be fair to say that only Europeans or Anglos can become citizens? If that's the case think if it was you the ones in question for citizenship My family has been part of this nation since the early 1800's and I do not think we should pick and chose. Ones again immigrants build this nation! No, absolutely not. What part of "ILLEGAL ALIEN" does our government not get? They are in this country illegally and should not be allowed to remain period. What about all those people jumping through the Bureaucratic hoops to enter and come to this country legally? What kind of a message does it send to them? You should have snuck across in the back of a truck? You do not reward bad behavior to get potential votes. I'm not sure if the US should make it easier for the 11 million illegal immigrants to become citizens but I’ll tell what we cannot do. We cannot deport 11 million people with their American citizens children back to the country where they came from. Here is what I’m suggesting we do. Have them pay a fine for entering the US illegally or overstaying their visa and pay the $675 fee to apply for citizenship. This is what some Dems & GOP is advocating but the real test is how well will this work. There is no "easy" answer to this problem but we must have a fair debate on the real issues surrounding this problem. We cannot afford to keep “sweeping it under the carpet”. In a word Jack...HELL NO! OK thats two words:) All these bleeding hearts hollering for "reform" really want out right AMNESTY for all the ILLEGALS! "Comprehensive" to them is AMNESTY for all the illegals! We might not be able to round them up an send them home to wherever but we can sure as hell NOT GIVE them benefits that you and I pay for! Yes. We can't ignore the problem any longer. And I mean quite literally, there are people in America who we pretend do not exist. They've rooted families and worked hard. They should be legalized so they can begin benefitting for the whole country, not just themselves. If we lessen our standards for citizenship, it will better the chances of terrorist extremists getting into this country. But on the same token, the procedures for citizenship should be reasonable and able to achieve within 1-2 years at the most. The government is going to have to decide which is more important. It is so sad that this is actually a question asked by a serious journalistic source. Should we also make it easier for other criminals to be de-criminalized? Ridiculous. We all know that the next move Obama is going to make is to make all illegals legal so that we can also pay for their health insurance. My father came through Ellis Island and never got a hand out like the illegals are getting. He worked very hard and became a citizen the right way. Why should they now be given a "free" pass? Some reasonable path to citizenship should be offered. Doesn't mean they should get an easy path. Definately requires background checks, pay a fine etc... I say issue them temporary Visas initially, then green cards within 3 years and Citizenship within 5-10 years. This way, they can be counted, legalized, assessed, and eventually naturalized. Sending them back to Mexico and the rest of Central America is just not a reasonable. Easier? No. Possible if they have a job and prove not to be a burden on the country? sure. That is how the immigrant system has worked in the past, and has proven to bring people in the country of great benefit to the nation. Don't make it easier but we need to grant amnesty to the 12 million or so illegals in this country! In order for them to become citizens they should have to learn English as the first language and pay a hefty fine for not being in our country legally and the ones who don't do this should have to leave with or without there families and then close off our borders and have tight security along our borders between the U.S. and Mexico! There can never be no real immigration and amnesty policy in this country until we close and seal off our borders and patrol them 24/7 and that's not only my opinion! I am an illegal immigrant . I overstayed here in US after coming legally with a visa student because I met my beautiful wife, fell deeply in love with her, and had a set of twin girls – 3 Y.O. now – with her . I love this country as my own country. We pay ALL our taxes, we bought a house, a car, we spend money in the economy, we never got in any kind of trouble with the law – except with the immigration law -, I learned English, etc, etc, etc . My girls are American Citizens and since last week my wife as well. Tell me something from the bottom of your heart: Do you really think I should be sent back to Brazil and live my two precious little girls and wife here alone ??? Do you honestly think somebody in a similar situation like me deserves that ??? hi. yes ithink thay should approve the case my husband waiting long time . thanks. Jack, not only should we NOT make it easier for illegals to become citizens, we should revoke the citizenship of previous illegals who were allowed to become citizens. All that making it easier for illegals to become citizens will result in, is MORE ILLEGALS!! If the "fast track" for illegals to become citizens comes to a screeching halt, maybe they will return to their own countries and work to eliminate the conditions that cause them to come here illegally in the first place!! Jack, I think your first question kind of play's into the second. Do we really need to increase our tax burden. You know that most of these 11 million illegal immigrants are going too fall into that group of not paying a single dime in taxes, but oh boy will they use the hell out of the services!!! government acted on it. Flat Tax. As a person of Mexican heritage and third generation American, I am offended by this question. Why? Because Mexicans have no legal way to enter this country. There quota is set at zero. By the way, when you say illegal immigrants, 99% of Americans think "Mexican" not Polish, Irish, Russian, or even Asian. Not only NO, but Hell NO! People all over the world are waiting patiently with legal filings. Don't we have a quota from each country that are allowed in? Why should be floodgates be opened for Mexicans exclusively? Go back home, file legally, and wait your turn. Illegals should not be given citizenship under any condition. They have broken our laws and should have to go home and apply and wait like everyone else. It is especially wrong to ever allow them to stay in the U.S. and wait even though their names supposedly go to the bottom of the list. The whole time they have to wait they are enjoying all the benefits of our country while those that have applied legally must wait in their country. As you can see from their demonstrations they are really not interested in citizenship, only what the country will give them. Also with the proposed law, chain migration kicks in and they will bring all their extended families here, mother, father, brothers and sisters and their families. Do you know how many people that represents. Estimates have been over 200 million. Watch what you are doing. NO!! Not at all Jack! Think about the message that this will send. If this were to happen, then that would be point of reference for anyone caught breaking the law, that the U.S. Doesn't even follow its own laws. Example: Immigration laws.....just to start. Will making it easier to become a citizen make a difference? Do illegals want to pay taxes? Until we start punishing business that employ illegal aliens, are we really going to start to change anything? Yes, it's probably almost impossible to find then and deport them not to mention the cost. The last amnesty program by President Regan did not bring the world to an end. We cannot forget we are a nation of immigrants it is our greatest strength. Therefore, do the usual background checks and provide a path to citizenship to those who qualify apply a special fee for all unusual costs born by the tax payers. We make it very easy for Canadians and Western Europeans to get work permits, residency and even citizenship. And we have little problem doing the same for Orientals. Our problem seems to be with those people who are descendants of the original residents of the Americas. We earned our citizenship by conquest. Shouldn’t we now find some way to include America’s original inhabitants? I'm sorry, illegal immigrants should be kicked out. My wife and her family spent years and tens of thousands to come from Taiwan legally and get citizenship. They couldn't follow the laws and process for citizenship, why should they be given a chance to break other laws as well. It's unfair for immigrants who went through the process properly. I welcome legal immigrants, heck, I married one. Someone who doesn't like immigrants would probably say "If the citizenship process is too hard, then immigrants aren't trying hard enough." I say they aren't trying hard enough, either. However, making it easier would make going through the immigration proccess an easier choice than crossing the border with drug smugglers (and eventually owing them debts), a border that is patrolled by armed guards and predator drones....I'm pretty sure being arrested or getting killed are not risks when immigrating the legal way. The outrageous fees for immigration might make a big reduction in our National debt and rediuce our financial costs of assisting the INS to get rid of the 'outs'..
No... Not until the immigrants are separated from the economic refugees and the home countries held accountable through fair trade agreements or trade sanctions in the case of human rights violations. The immigrants are easy to spot. They speak English, salute our flag and spend their money in this country. Before considering amnesty, we must conrol the border. In 1986 we passed Amnesty and never encofed the provisuions of the Bill intended to stop iollegal immigration. Amnsety without border control is doomed to failer. Secondly we should not consider amnesty until we know how many aqre involed and the20 year cost. WE should offer illegals an 18 month visa; reusal would then disqualify them. Then we get a count – which will probnably be twicwe the ususl estimate. Hi Jack: No we should not make it easier for them to become citizens. They are here illegally. Go home and make things better in your own country. Other countries deport illegal aliens and we should too!!!!!!!! If you give illegal aliens amnesty again, more will come to replace them, just like the last time. Why not just open the borders to all? It's really the reality of the situation anyway. Why? Should they not have to go through a citizenship process? If they can sucessfully complete this process, they will be smarter than 95% of the people that voted for Obama. Democrats should fear this process, a smart electorate would drive them from power. Illegal immigrants should be given 15 months to register, pay a fee, get in the back of the line and return home. Amnesty is not the answer for immigration. After the fifteen months has expired those who recieve social services and any other state and or government services will be cut off and cannot apply for citizenship for seven years. For all of those who comply they should be given a path to citizenship in a realistic manner. The United States should privide temporary visas to help offset the mass exodus back to their country of orgin. You should not be able to be in this country illegally while awaiting your citizenship results. No way! We have laws to legally admit hundreds of thousands of aliens into the U.S. annually for permanent residence and eventual U.S. Citizenship. Don't reward the law breakers who cut in line by jumping the border or overstaying their visitor visas, especially with our current unemployment crisis. Let them get in line with the rest of the people in the world who want to immigrate to the U.S. and require them to do it legally like the law says. No, it's a privilege to became a U.S. citizen, giving it away would only turn the U.S. into a third world country. If you look at the country right now we have tens of millions of illegals who's children are born as Americans, but their parent spend the rest of their lives in country, not learning how to speak the language, not interacting with the rest of us, and in many way they are developing into another country within our borders. If you look at Texas ans some of our southern states, in many cases some towns don't speak English at all, are people just refuse to see that there is a foothold situation going on in our country! Well at the risk of being labeled xenophobic, there seem to be several questions that we ought to be raising about immigration in general. First, with a 10% unemployment rate, how do we justify giving jobs to foreign workers–drywall, framing, electrical, plumbing and even computer engineering. Second, with states like California already hard pressed to find enough resources, like water, to sustain the existing population, why would we want more citizens? And last but not least, if we qualify all these very low skilled workers for citizenship what happens to the already underfunded Social Security and Medicare system? These folks haven't paid into the system but you know there will be a large venting of support for providing service (disproportionate to any contributions that have been made). We need a meaningful reevaluation of immigration...oops, but that means Congress would have to do it. Forget it. Yes it would force employers to pay their fair tax as well as the workers. It's not the immigrants who are the problem. Believe me many seniors are planning to retire out side the USA. Better health care and warmer climate and a more simple life. The US is going to have to find revenue somewhere to feed the appetite of the American Elite. We can either give them a path to citizenship and start receiving tax revenue from them or we can deport all of theme en masse, destablize Mexico, and have even more of them cross the border to avoid the chaos of Mexico collapsing. Jack, no illegal immigrants no matter where they come from should be allowed to stay in our country. They should be rounded up by the U.S. military, tagged with radio frequency ID chips and deported to their country of origin. Please, just STOP and end the hipocrisy, american people don't want illegal immigrants here but at the same time all of us keep buying carpets and chicken from Georgia, produce from California, tobacco from North Carolina, etc, atc. You all want illegals out of the country but would never stop buying products or services that have an illegal immigrant hand behind it. So you all either deport them all or legalize them,. Jack, since they are already here, why don't we make them citizens and give them the opportunity to pay taxes like the rest of us? no, and we should make the go home or face jail and then go home. If they're here illegally, they should have to go to the back of the line for a visa. Allowing illegals an easier path to citizenship is a slap in the face to those who follow the rules. Not anytime soon before they do the same for legal immigrants who have played by our rules and stayed in line. If anything, they should make it easier for illegal immigrants to go back to being citizens of wherever they came! How does the US benefit from this? Who's to say the immigrants even want to be citizens? We have enough dependants on the welfare system. No, to easy citizenship, and they should have to go home until we need them. No! Illegal means they broke the law. Would you make it easier for car thieves to get car loans just because they steal cars? I am being sworn in this week as a new American citizen, and I feel that every new immigrant should have to go through the lengthy process just as I, and millions of other, have done. To give illegal immigrants a "free pass" makes a mockery of the immigration laws and is insulting to those of us who have gone through the necessary steps required for citizenship. Being a citizen of this country is NOT a right for immigrants, it is a privilege, one that should be earned. Yes! Absolutely. I see these immigrants as paying for my Social Security retirement when I turn 65 or 70 in 6 or 11 years. The more people who come into the country to pay taxes and the like the more likely I'm going to be able to collect on Social Security. Bring them in! We need more. Open the borders and let anyone come in who agrees to become legal and pay taxes. Yes ..I believe as long as they are "law" abiding citizens . They can make good citizens of the USA. Pay a fine and lets move on. It is wrong that we treat them as 2nd class. Something needs to be remedied. Will they start paying income taxes and for their medical care. That would be nice. Then yes, I agree. I don't like the idea of rewarding people for illegal activity. Giving any form of amnesty to people who come to this country illegally is just that. However, what are we supposed to do? Round up all illegal immigrants and ship them back to their respective countries or throw them in jail? Both options would be expensive, and morally questionable. I don't think amnesty is the answer, but what else can we do? Yes! If that many normally honest, upstanding people are breaking a law, I think there must be something wrong with the law. Absolutely. Where do you think the bowl of fruit sitting on your kitchen table comes from? There are so many financial ramifications that we would suffer if we kowtowed to the xenophobic tendencies of some. It would be fair to charge a fine to those who entered the nation illegally, but just kicking them out is not a feasible or humane solution. Yes, make it easier!! Get them into the system they can contribute and get the benefits. Get over it or get counseling!! No, no ,no. You jump our fence, you come in pickups and vans and now you think you should be a citizen. Not so, come legally and apply like others do and then you are welcome. I don't see Americans flocking to Mexico illegally. Mexico needs to improve its economy so its citizens want to stay there and not come here. I am tired of illegals demanding rights in the United States. They have none unless they come the legal way. Immigration: No. Path to citizenship: Yes. Easier path to citizenship: No. Hear is as far as my sympathy of immigrants in light of my 200 years of genealogy as taken me.....African and Native American. If they're here, let them work and lets educate them, but (like in times like these) when its time to send them back, we should do so. Bigger border walls and dumber immigrants won't prevent the migration. No, it should not be easier to become a citizen. maybe 3 years. They are illegal. Yes. We made it easy for them to come to our country "illegally" for the past 50 or 60 years. We make it easy to hire them or do business with them. We make it easy for them to get an education, to receive medical care, to drive cars. We make it hard for them to become citizens and pay their fair share of social security, medicare and state and federal taxes, or serve in the military, or other state and federal forms of service. What's up with that? Amnesty is wrong. I do not agree with it and if we pass it, millions more will come and go on our heathcare sytem draining American taxpayers. They need to go back to their own country. Law is law and we all have to obey the law. The question should be, "Should we make it POSSIBLE for illegals to gain citizenship?" The purposed plans merely provide paths to citizenship as there is no path now for an illegal with a steady job. They must pay penalties and wait for citizenship behind everyone else, so I wouldn't call it easier. If we don't give illegals any options besides deportation, what choice do they have besides hiding in the shadows of our society. I want to vote NO, but Congress and the Prez go against the electorate, so I guess using reverse psychology this should be a 'YES' . Go figure – actually GO HOME illegal immigrants and also Congress and the prez. Easy citizenship for illegals? NO. I have friends here who have come to the USA as legal immigrants, and are made to jump through all sorts of ridiculously difficult hoops. They follow the rules. If things should be made easier for anyone, it should be for those who have come here by following the rules, and who continue to do so. We should be "rewarding" those who add to our society and culture, yes, but reward those who do so legally. Rewarding the law-breakers just discourages those who do follow the rules, and encourages more to ignore the rules. YES, I believe so. The goverenment should charge $10,000-15,000 per person who desires a path to citizenship. This could help to some degree our economy. People have to stop denying that undocumented immigrants do the jobs that most Americans don't want to do. No. They should be made to go back home. Once there, they should go through the same process that legal immigrants went through to live in the United States on a permanent basis. No. Make the jobs available for Americans first because, with unemploymnet of 9.7%, Americans need the jobs. If we need farm labor, let them work on a limited work permit so they go home quickly. Use E-verify and do not hire anyone that is illegal. It is also time to start checking ALL employees for citizenship. Part of our education downfall is trying to teach English to children of illegal immigrants rather than teaching basic subjects. 50% of us pay taxes to support the other 50%, and the democrats want to make us support 11-12 million MORE? Don't THINK so! Yes, most of the Mexicans are trying to escape horrible conditions, are doing what is necessary for survival and to provide the best for their families. We ungrateful Americans need to put ourselves in their shoes to try and understand what their sacrifices and struggles. I would do the same for my family. Wouldn’t you? How about the this, Im a Registered Nurse Here. Passed English with highest score. Im single and I have been doing everything to become A US resident. Ive been coming back and forth to the the US for the past ten years and nothing has been done for us who are going to that legal Immigration route. I have a petition, pay the USCIS thousands of dollars and yet we dont see any light to our plight. So, do they(illegal immigrants, who some of them wave mexican flag and dont even speak english) deserve an attention? not at all! They should not make it easier; they should make it harder. My grandparents immigrated at the turn of the last century and it was not a "cakewalk" to migrate to the United States and become a citizen. Why should we reward people for breaking the law and bypassing immigration laws and come to this country? Worse yet, their children receive benefits of citizenship being born here, public education and free medical care. While, the immigrants of my grandparent's era, lucky if they could find a job. As fro immigration laws in general, millions of citizen professionals are out of work, because the lax work visa process in this country. Why can companies employ green card holders from India in the IT profession, while thousands of citizen IT workers are out of work? If you look at other industrialized nations, their immigration laws are much more restrictive than our own. If you don't believe me, Jack, try applying for a job in Canada or Europe. Yes. The reason they're here illegally in the FIRST place is because of how difficult it is to immigrate legally. As long as they are here serving us, building our houses, working on our cars, etc, LET THEM PAY THEIR TAXES. For the most part, they're not going anywhere. Yes Jack. So they can pay taxes like the rest of us. Illegal immigrants use our hospitals, civic centers, roads and don't pay anything but sales tax on what they buy. I pay tons of money in taxes for these things and they should too. They're not going home you know. If you are a citizen and break the law; what happens? You get busted. If you are illegal; you are already a lawbreaker. Good-bye. Absolutely make it hard! I work in construction and have been out of work for over a year. As I talk to friends who work as supervisors and the like, I am told that well over 75% of the workers currently with jobs in construction are hispanic, and most openly admit to being illegal. Most come through temp services who take their papers at face value. It must be easier to say 'I had no way of knowing' than it is to put real Americans to work. No way! Those who want entry should have to go through vigorous processes to obtain citizenship. Changing the legislation to allow easier access to citizenship would show a weakness on the behalf of the U.S. Government. Washington should keep its backbone. Sure allowing immigrants easier access to citizenship would relieve the stress of enforcing the strict laws, but at the price of standing for principle and the rights of U.S. citizens (those born here as well as those who followed the rules). I think not. NO. The route to citizenship is go back to your now country, apply for a green card. When received, then come to the US and await the appropriate time to apply for citizenship. No, Jack. The reason the Democrats want to legalize the illegal is to get their votes, AGAIN with other people's money. Too many of these Hispanics are coming here only to grab on to the entitlements, while having more and more children. I am TIRED of paying to raise their families while I work 6 days a week just to take care of mine. YES we should make it easier for them to become citizens. We are talking about human beings who come to this great country of ours to have a better life JUST LIKE OUR ANCESTOR DID!!! As good Christians we must show some compassion to those less fortunate. No! I understand that they are breaking a federal law, if they are illegal. There are legal provisions in place to accomplish the actions they wish to pursue. Do it legally or not at all! Hold Mexico accountable for the actions of their citizens! NO! Anchor babies or not...illegal is illegal. We should not reward illegal behavior with US citizenship. Go to the back of the line and do it right, as legal immigrants have done for decades. And let us not turn this into a race issue. IT IS NOT. It is an issue of legal passage into our country. Most of these potential citizens would fall into the category of the 47% of Americans who do not pay taxes. Given the state of the U.S. government's financials, could we as American taxpayers afford a large proportional increase of people who receive money from the government simply for being a citizen? Clearly we cannot. Having worked with some of the immigrants, I know how hard it is to become a US citizen. Not only are the forms very expensive, but if some small detail isn't exactly right, they have to start all over. And they have to go to Omaha, 75 miles away, to process the paper, standing outside in the snow for hours. I think we've forgotten practically all of us have immigrant ancestors, that didn't have to fill out forms, or pay anything, but were given land grants to settle here. We're more concerned with legality than we are with welcoming the newcomers and benefiting from their family values. Why such tight restrictions in the first place? Again and again over the course of history, immigrants have helped make this country greater – including one of the original 13 being a PENAL COLONY, if memory serves! What makes our recent leaders think the future will be any different? I say minimize the immigration requirements and then re-evaluate under the new standards any illegals found subsequently. NO WAY!!!! I for one am sick of being accused of breaking up thier families by expecting them to obey the laws of this country. They are the ones who cross illegally into this country when they KNOW its against the law. THEY are the ones who deliberatly have these babies all the while knowing they are here illegally. Im sure that the Medicaid doctors know about the Pill.. Why arent they prescribing them to the illegals? Enough of the free handouts. If you dont want your family "broken up" TAKE YOUR CHILDREN HOME WITH YOU WHEN YOU GET DEPOORTED. We have enough of our own to support. No way! Those who want entry should have to go through vigorous processes to obtain citizenship. Changing the legislation to allow easier access to citizenship would show a weakness on the behalf of the U.S. Government. Washington should keep its backbone. Sure allowing immigrants easier access to citizenship would relieve the stress of enforcing the strict laws, but at the price of standing for principle and the rights of U.S. citizens (those born here as well as those who followed the rules). I think not sir. It is a well known strategy that nations with high birth rates gain access to democratic societies in the western world, both Europe and America to get on our welfare rolls which fund their citizenship, and achieve the right to vote, Then they vote in their own candidates. Western Europe has already been taken over by Muslims and we are being taken over similarly by latins from Central and South America. will someone please explain to me what's wrong with staying in your own country and making it a better place? Yes. It makes me ashamed to call myself an American and say that we believe in freedom when so many of these people are suffering. Before everyone jumps to judge they need to think of how fortunate they are to have been born in a place such as this and what they were to do if they were placed in other circumstances. Many of these people are coming from unfortunate circumstances here not because they choose to but because they have to, sometimes for their survival, and they should not have to pay for it for the rest of their lives and fear in such times as these to be separated from the people they love. The majority of Americans do not know the difference between permanent residence and citizenship. It is not necessary to be a citizen to live in this country. What people need is an opportunity to legally provide for their family...just like anybody else. They are not responsible for the country's economic woes. After all, they make up such a small percentage of the population. I am not crazy about the idea of illegals becoming citizens but if we do it , it should be a one time only event. They take the tests,learn the language of the US, start paying taxes and back taxes and also the males have to sign up for selective service as well. If they do not pass the test and comply to the rules of citizenship, then they are deported. Also this is it, no more Mr. nice guy. We have to close the door so this does not happen again. My grandparents had to EARN the right to come here. They did not just show up and demand everything that is entitled by citizenship. The next time that I have to go to the ER I will simply say "No hablo ingles" and my healthcare will be free. WOW! Imagine that, free healthcare only if you are NOT a citizen. Plus, the state has to pay for the education of my illegal children. Does something sound wrong to you? I am all for legal immigrants who come into our country legally. Why should we reward people who break the law? ?Do we really want that kind of person as a U.S. citizen? A person that would break the law for his/her own personal good should not be given citizenship. This is not a subject the Gov. wants to take up at this time. They know that Americans will revolt if the Mexicans get amnesty. REMEMBER the Cuban invasion 1986??? The Gov. gave 5 to 6 million Cubans amnest and said that this country would never do that again. Well I for one hope our government keeps their promise to us AMERICANS. There are rules for all the people all over the world to become legal in this country but we haven't followed them in a very long time. Actually there are a few too many illegals to send them all home. Legalize the ones who are working, tax them, and send home anyone who is remotely involved with drugs. Simple answer, Jack: No. We need to send a clear message. Send all illegal immigrants back home NOW. Let them go through the processes available to allow them to be in this country legally. And we also need to prosecute those who would hire illegal aliens. If we decrease the demand for illegal aliens in this country, the supply will begin to dry up. With the high unemployment rate as it is now, American citizens should be given preferences for jobs, not aliens who jump our borders. I strongly oposse to more anmisty for indocumented allies, this will promote more waves of illegals immigrants as happen with the last 5 millions in the 80's. It's time to have a real ID system to work. Employers should be remaider that we have milions of US citizens out of work. This Independent households saysNO AMNESTY !! !, no free social systems, no free medical care, no freebies at all. They should be made to go back where they came from and start from scratch. Sign up and come like all of my great grandparents did thru someplace like Ellis Island. The Regan Amnesty program didn't stop illegals, it encouraged more. Immigration is fine, just legal immigration like our fore fathers had to do. That way they pay their fare share of living in the USA. If you don't earn it, you don't respect it. Most illegals do not respect any part of our systems. They just take everything they can get. Hell No. It is hard enough for Americans to find work now. That is what is wrong with our country now.. Yes, I believe we should give those who have been here for at least five years and have been productive a way to regularize there immigration status. Continue to work on tightening the border and get rid of those who commit crimes, but give law-abiding aliens a way to stay legally. Until unemployment reaches a true 5% or lower our representatives should honor the vows taken when entering office and do their jobs deport if illegal. We are NOT destroying families. These people choose to not do things right in the first place. It is enough we paid for the births, we should not be forever obligated to pay for their housing, food, and now healthcare. So sorry, but NO NO NO. If they truly want to be here they should have to bide by our LAWS!!!! Be here legally first off, go to classes, learn ENGLISH (our official language). My father in 1926, gave up this homeland and heritage to become an American, did by the book (LAW). No, but they should be REQUIRED to serve in the U.S. military. Become a legal citizen and serve your country! no just because they can sneak across an unsecured border to work as gardeners and maids, this should not be the criteria for demanding citizenship and all the privileges that go with it. They also do not want to learn to speak or read english because this would destroy their culture. Many people from other countries come here legally the right way often waiting many years they do not live close enough to cross a border and this would be unfair to these people if U.S. citizenship gets doled out to everyone and anyone like candy. Simple answer, NO. But the truth is that turning illegals into legal citizens will only cause more problems. SO many illegals offer services in farming, manufacturing and construction well below the US minimum wage. As legal residents it will be required to pay minimum wage (at least), and are we ready to pay $6.00 for a head of lettuce or more for new construction and the few products still made in the USA? The sad truth is no. Everything is about money and immigration is no different. Is this a trick question Jack ? The word illegal says you broke the law. Should we reward lawbreakers with amnesty ? This is a true oxymoron. If you get caught speeding, does the judge give give you amnesty ? I don't think breaking the law entitles you to forgiveness. There is still a right way to become a citizen in this country. Deny citizenship for 10-15 years, but let them work, stay, travel and pay tax, pay fines, back taxes, do community work, learn English, etc. No vote for 15 years, no welfare, any social benefit, food stamps, nothing. Make it easier for illegal immigrants to become U.S. citizens? Absolutely not! How about making it easier for those who are disabled in our armed services to get their benefits? How about doing that Mr. President! People need to be reminded that most of us come from an immigrant situation.....our parents....grandparents.....why are we to prevent others from the American experience and an opportunity to reach potential. Our country has been built on the skills of immigrants!!!! No we should not make it easier. If your not here legally GET OUT! We do not have the job's or the resources to handle this. Look at our unemployed Families that will not get a check this week. We need to fix that problem first before we let 11 million more people in our country. People wake up and get real! Your (pseudo) analysis or editorial on immigration reform smacks of intellectual dis-honesty! Your position on immigration reform is more than clear: You make Lou Dobbs look like an "altar boy" on this. In brief, using questionable polls, you clearly lead your CNN audience into an hostile position, i.e., against any "legalization" which you dishonestly term "amnesty". Why then do you even bother to invite any debate on this? We support our President in finding a humane and legally- fair way out of this issue which has been hijacked and manipulated by Republicans and their Tea-Party thugs to fan xenophobic sentiments for political gains. Despite your journalistic pretentions, you have bought into this RNC/ Tea-Party xenophobic hysteria !!! Why should it be made easier ? What gets me is all those who are not citizens yet benefit from government paid programs that the citizens paid for through taxes. No, i think the american people need all the help that our government can give us, and i think the mexican government need to be forced to help their people, instead of only themselves. we have sent a lot of jobs to mexico, but have they sent even one job over here to give americans jobs? No, we should absolutely NOT give amnesty or make it any easier for illegals to stay here. California is financially strapped largely due to supporting illegal immigrants to stay and have anchor babies who become just another generation to drain public resources meant for taxpaying CITIZENS. Providing healthcare and welfare benefits, etc., to illegals is like a storeowner catching a shoplifter and telling them not to come back into the store, but then allowing them back in the next day to steal again. Not a very good way to run a business, right? The sooner government starts taking lessons from successful, well-run businesses, the better we will be. BTW, I am a registered democrat. In Arizona we know the issue is not citizenship, rather it is legal residency. We must let our millions of undocumented immigrants apply to be legal residents, as long as they are not criminals and are self-supporting. Once they are legal residents, each can decide whether or not to apply for citizenship under the existing laws. Those who don't meet these standards should be deported at once. Absolutely Not. Thet are not supposed to be in this country. Sheesh. Give them six months to leave the country unmolested. If caught here after that period, arrest them and give them to Sheriff Arpiao for six months and then deport them without the right to ever apply for citistzenship. If caught a third time increase their time with the sheriff to 1 year. NO!NO! and then NO! My husband came to this country 42 years ago from Britain. It took over a year for him to get clearance to legally immigrate even though he had a sponsor, a job and a residence waiting for him and he even speaks English! I am tired of the arrogance of most of the illegals who want us to speak their language, give them benifits that we citizens and legal permanent residents such as my husband have worked hard for over the years and make things easy for them. Enough! NO, we should not make it easier for illegal immigrants to become citizens. Also, babies born in the USA should have to have both parents legal citizens BEFORE they become legal citizens. I am a 72 year old life long Democrat. I agree with President Obama on most issues but I am firmly opposed to his stand on allowing illegal aliens an easier path to US citizenship. 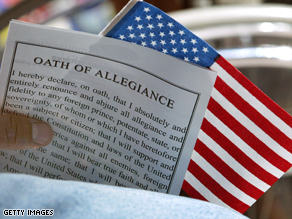 US citizenship is a privilege and not another give away. Here we complain about taxes everyday, why don't we have them pay a fine and start paying taxes. With 11 million illegals here that would make a little difference in our deficit. We also have to remember a majority of our ancestors were illegal too at one time!!!! apply for citizenship legally. Being in a border town we see them here already and they are already receiving social services because they are anchor babies. Meanwhile, true Americans don't get the help they need. Absolutely not ! Let the bleeding hearts move to Hazleton, PA. They can see what these ILLEGAL ALIENS have done to a once nice town. The U.S. can invade countries across the globe but won't do one thing to stop the invasion of our own country. ILLEGAL mean ILLEGAL. Round them up; get them out ! Not only should no illegal allien be granted amnesty, no illegal allien should benefit in any way from their illegal entry into this country. I find it disgusting that millions would violate our laws and then demand amnesty for their breaking those laws. Insanity. of persons in the country illegally. Absolutely not! By definition an illegal alien is a criminal. We do not need any more criminals in this country. People who are here illegally, no matter what country they come from, should be returned home. There are legal means to enter and remain in this country. People who want to live here should use those means. Look because of the economy, I have have two of my daughters move back home with us. One of my daughters have two children....We are holding our own and not asking anyone and that means the government for help...So why should I feel sorry for illegals??? And most Americans are getting sick of being called rascists for not wanting to hand over everything to them....we just have ZERO respect for them....They broke into our country like theives in the night and have the nerve to parade in our streets and demand MORE...The answer is hell no, start sending them back to wherever they came from!! Make it easier for the illegal immigrants to go back and bill the nation of origin for transportation cost as well as the cost of incarcerating those we currently house. We should allow the offspring of those here illegally to apply for citizenship when they reach maturity and meet the criteria for immigration. The artificially repressed economy will disappear as wages increase due to increased labor demand. Social programs will benefit when the negative cash flow abruptly halts. Of course we should vote out the political paycheck collectors whose inactivity have brought us to this precipice. No Way!!!! America is going away fast!!! We can't take care of our own. I am weary of people who enter our land illegally, then have the nerve to take to our streets, waving foreign flags and demanding citizenship. No Amnesty. Go back home and do it right, plain and simple. NO- They broke the law. They should not be rwarded for that.. Our jobs have gone over seas, our middle class is shrinking, and poverty is increasing. We need to bring jobs here not more people. I've got mixed emotions on this one Jack. 100 years ago the line to get in formed on Ellis Island. Today the island's closed but the line's so long folks are just ignoring it and simply walking over the Swiss cheese we call a border. Which reminds me, I haven't met a single illegal from Switzerland yet. I suggest we relocate the Statue of Liberty to the Mexican border and legalize those already here so long as they agree to pay taxes, Social Security and promise to stay out of jail. Certainly not! Illigal aliens are criminals for blatantly violating U.S. law and should never be given a fast track to citizenship. To do so would be a frustrating stab in the back to those who are completing and those who have completed the immigration process to become U.S. citizens. Sure, Jack. Just as soon as they make it easier for legal immigrants. Like me. It's not easy for anyone. Illegal. or legal. I have been in this inefficient system waiting for a Green Card since 2007. Nothing is easy even with an Immigration Lawyer. American should stop complaining with with your silly polls about immigration. Illegal immigrants are a very vital part of the country in many ways. Illegals are doing the jobs that benefit Americans who would never do these jobs. Illegals need an opportunity to get on the path to citizenship and American should either stop complaining about providing that path or stop just accept the status quot. But nothing is easy for any of us. Illegal or legal when they system is COMPLETELY broken and ineffective. We should not reward these people for flagrantly disregarding our immigration laws. Big business likes to pay them nothing to increase their profits, but then leaves it to the U.S. taxpayer to provide all their medical, educational, social, and judiicial costs. It is bankrupting the country. Now, they want us to let all their relatives come in. They made the choice to break up their families to come here illegally. They should go home and apply to come back in legally. Absolutely not! They should be required to leave the country and apply through normal channels. I see no reason why they should be rewarded for breaking the law. My answer to that problem is, Heck no. As long as our unlawful guests don't respect our customs and assimilate as well as learn our language, there should be absolutely no expeding to US Citizenship. I came over legally as a child with my mom, we played by the rules all the way. should they have special privileges. It took me 23 years to get mine because we moved around so much, even as an Army wife. There are plenty of others like me. It's worth the wait.. It is priceless. Let's not cheapen it. NO they broke the law. they should not be rewarded for that. Our jobs have gone over seas. Our middle class is shrinking, poverty is increasing. How will we feed very one. We need more jobs not more people who can't speak english. Heck no!...While I can understand why the illegals would want to enjoy the benefits of America, sneaking into the country to do so is no more acceptable than having a squatter move into your house and refuse to leave. I wonder how many jobs the 11 million illegals take away from unemployed Americans? If we didn't have millions of illegals willing to work for very low wages, wouldn't even low paying jobs pay more than the minimum wage? How many children of illegals are swelling the load on our public education system and draining our the social services funds? Past amnesty programs have only increased the flood of illegals into America – how many times do we have to repeat the mistakes of our past? Jack, I'm an immigrant. A legal immigrant. I'm now a US citizen, but it took me twenty years. Why? I didn't wanted to take such a drastic step until I was willing to be an American in every way, including my thinking. Believe me, breaking the laws of the United States is a bad start. If we had any other country sending millions of their poor across our borders to invade we would be in a war. All we have to do to fix the problem is enforce the laws already on the books and really fine or imprison the employers that hire them and take away all social services and benefits to those illegally here. They will self deport. If the magnets aren't here then neither will they be. And this whole idea of them doing jobs Americans won't do is ridiculous. If Obama really wanted to get Americans back to work he would make e-verify mandatory and open up those jobs. Stop tearing our families apart? Give me a break... These people come into this country illegally & then demand we make allowences for their criminal behavior. Only in the U.S. If I went to Mexico, moved my family there, refused to learn the language,used fake ID's and demanded the same rights as a legal citizen, just thow far would I make it before I landed at immigration or in jail? Most people in this country have ancestors that came from another country, but they came legally. I have zero tolerance for anyone who sneaks into the U.S. and demands the same rights as someone who comes here legally or is born here. To me its a no brainer.Who do these people think they are? By the way,I live in Houston TX– a santuary city and I am having to learn Spanish to make myself marketable.. Something isn't right about that.. Yes of course, no wonder our country is going down the tube. Just asking this kind of question is the proof that our nation is the most insensitive creatures on the planet. People forgot that USA was build by foreigner (yes all of you who are saying no) and trying to split up families who are living for years in United States is showing even more to the world how inhuman, selfish and disgusting Americans really are! Haven't you learned yet Jack? It doesn't matter what we want. The new way in Washington is to shove everything down our throats while we're all struggling to keep our heads above water. America is the great "melting pot" of the world. If a person wants to be a citizen, give a 5 year waiting period. If their record is clean, no broken laws, let them become Americans. Learn our language, obey or laws, keep your culture, Be good citizens and good neighbors. Welcome to America. There are 11 million different stories of how people became undocumented and most are because of a broken immigration system. The end result is a sub-class of hard working individuals whose options are to stay under the status-quo or go back to their country of origin and not return for at least 10 years. To those who were brought here as children (as I was), US is the only place they can call home. Wouldn't you stay too? We need to get beyond the label of 'illegal' and work on reform. Illegal immigrants who show no regard for our immigration and labor laws should not be rewarded with a path to citizenship. They have knowingly and blatantly stolen jobs and depressed salaries of US citizens. What kind of message would our government be sending to those legal immigrants with temporary visas who have obeyed our immigration and labor laws, and departed this country when their visas indicate they must do so. Our politicians should be more concerned with enforcing our immigration and labor laws instead of trying to change them to appease special interest groups. Possibly, for people who otherwise have lived within the law. But only if we control our borders, know who is in the country and decide to what extent we wish to continue to allow immigration and by whom with what skills. This isn't the 1880's and we are not trying to populate the west and we should decide the full range of immigration issues. I will try to get my reps to block anything else. no. I can"t chose which laws that I will follow. They (Illegal aliens) break the law by enter the United States an not follow they legal process of becoming a US citizen. Sorry Jack, but when we have 10% unemployment - immigration reform is a Red Herring - a distraction from the real problems facing Americans - we need to fix that before we talk about immigration reform. is naive to think millions of people that will improve the economy with the taxes they will pay fines and and fees for the processing, be deported causing massive amount of money going ou t,while, you the tax payers and gov, could get billions to fix the holes peolpe in wall street, ceo of big companies like gm and other get us in this .dont blame immigrants, those oppose there is raccisim behind it the they can not yell that loud and hide it with other words. No I don't think we should make it easier for illegals to become citizens. I'm 66 years old and as far back as I can remember I was taught the word illegal meant you were breaking the law and would be punished. So why are we as taxpayers supporting them. Here's a thought. Instead of sacrificing our troops fighting wars where we're not wanted, bring them home, put some on our borders protecting our borders, and the rest rounding up the illegals and sending them back where they came from. It's time our government does something for the citizens of our country. I missed answering your first question but in fact both of your questions are related since a couple making 50K with two children depending on where they live they are not even middle class. Instead of saying 50% do not pay federal taxes we need to express how 50% do not make enough money to even pay federal income tax; it just goes to show that the trickle down economics has not worked so far!!! As for immigration reforms we need to seriously consider that being illegal makes people vulnerable to lower salary which means again paying less federal income tax plus on top of being illegal it also means that maybe a higher number of people do not pay federal tax because of their status which I'm sure people would prefer to have peace of mind and be a contributing citizens!!! How many years have some illegal immigrants have been in the country and they are part of the community! Even with less employment, we must reform immigration to fix people's status and get in more revenues and stop at the same time the abuse that comes from being illegal which is getting a lower salary because of their status! At the end of the day, defending and standing up for human dignity is one of America's founding principle! Resources are limited! My family income is half of what it was two years ago and we're struggling, It is not time to give preference to illegals when us regular folks aren't making it. Let's get a secure border fence and tamper proof ID cards to ensure legal Americans get the jobs first. Years from now (and in the current environment, if will be years) , if our economy has the capacity, we can address helping immigrants transition to legal jobs in our country. Any politician who wants to give amnesty to illegals in the current environment is asking for political suicide. I promise you–I will be at the front of the line with Lou protesting against any preferences given to illegals. People who like to use fancy words like "xenophbic" to make themselves feel smart and morally superior need to understand something. It does not make someone prejudiced or xenophobic (as you say) to have a respect for the law and want the law followed and enforced. It also doesn't make you any smarter to resort to name calling as opposed to making a rational argument on the merits. Thank God our ancestors found an opening to come into this country. Since Money talks in the US, Lets talk about 1.2 Trillion that Immigration Reform will bring to the US. YES WAY!!! Did our Ancestors came here legally? Immigration is not a problem, the problem is those who take advantage of the "illegal" situation such as governments, companies, hate groups... you name it. They are human beings just like you and me, let them be part of this great nation. No, absolutely not. The vast majority of illegal immigrants have come from Mexico. Consequently, any statement suggesting that borders should be managed / illegalities controlled is viewed as a racial one. However, it is the contention that this is "racially" motivated that is itself the "racism". If America does not control its own borders, then the govt. has backed off its single more important function – to defend the U.S. The current view is that the U.S. is a souk or big bazaar wherein anyone and everyone can come market their services and wares. It is NOT one. There are neighborhoods in southern CA that nobody speaks English, where the Mexican flag is flown, and where Cinco de Mayo is THE holiday, not July 4th. Again, no problems, give folks who want to work here a "green card", let them work then leave. But not citizenship. Jack, It sends the wrong message to allow illegal aliens to stay in this country. They have committed an illegal act and broken our laws, but they benefit from breaking our laws. Then we further reward them with free education, free medical care, welfare, subsidized housing, food stamps, welfare for their children, and other benefits, not even natural citizens are entitled. I am probably considered a liberal, but I vehemently oppose giving illegal aliens a free pass. Our natural citizens receive felonies for breaking laws, not as nearly as severe as individuals crossing our border illegally. It should be a felony for any person to enter our country without permission. Moreover, we need to prevent any act, such as English as a second language, hiring individuals, specifically because they are bilingual, at the expense of our natural norn citizens who are not bilingual. These acts only make it easier and inviting for illegal aliens to invade our country to reap benefits they have not earned. It depends, are these illegal immigrants coming to the United States for good reasons or bad reasons? The question is to come or not to come? That they will help US by paying taxes? I just read an article on CNN saying that 47% of Americans do not pay taxes due to low income or tax credits, in which bracket are they going to fall in? The U.S. should make it easier for the estimated 11 million illegal immigrants, who really want to build up America, to become citizens! For those illegal immigrants the U.S. should change the Illegal Immigration Reform and Immigrant Responsibility Act (IIRIRA) or create New Laws to make it easier for illegal immigrants, who really want to build up America, to become citizens! The U.S. should make it easier for the estimated 11 million illegal immigrants, who really want to build up America, to become U.S. citizens! I am an American Mexican from San Antonio, TX. and I don't agree that the U.S. Gov't should allow millions of illegal immigrants to become citizens. First of all they are here illegally and that's not right! If you allow this. Then word get's out and millions more will come from Mexico, since that is an easy entrance to the U.S. Other countries don't have it as easy to come into the country like Mexico. The problem is that these illegals don't pay taxes and they drain our economy. Thus our taxes continue to rise every year to pick up the cost. And if we con't pay out taxes, we could loose our home. The other illegal family member have also learned to manipulate the sytem and get welfare and assistance at the tax payers expense. That would be rewarding bad behaviour. There are plaenty of people that have gone thru the correct channels. What about them? NO! Millions of American jobs are lost to illegals. Almost forgot to mention, they actually pay more taxes by been here Illegally, since they do not claim them back...(I actually support legalization for many other reasons but I do not think that paying taxes is the issue here). I cant believe Mr. Cafferty is so disinformed, the proposal in the senate is not to give CITIZENSHIP to illegals. The proposal would give illegals a temporary work permit and the chance to become LEGAL RESIDENTS if they follow the rules and go back in the line, then they might become CITIZENS. And anyway. Can someone tell me how to deport 11 MILLIONS if the average cost for this country in order to deport an illegal is 4.000 per illegal, do de math! besides this people is already here, working (cause and illegal alien can't get any social security benefit) and not paying the taxes that this country desperate needs, so lets be practical and use common sense. I honestly don't believe that these illegal aliens want to become citizens. Some just come here to work to make life easier to live where they are citizens.